Pick between 5 different background images, add the characters you want to the picture. Enlarge, reduce or rotate the graphics. Add your personal message. Lastly, fill out the ecard form with the sender and recipient details, and click on "Send" at the bottom of the page. Decorate to your liking! Happy Birthday or others greetings. Write the name that you want with your own personal message. Ghost - Make an eCard for someone special. Create your e-card: Happy Holiday! Create your eCard: Merry Christmas! Create your Christmas Greeting card! 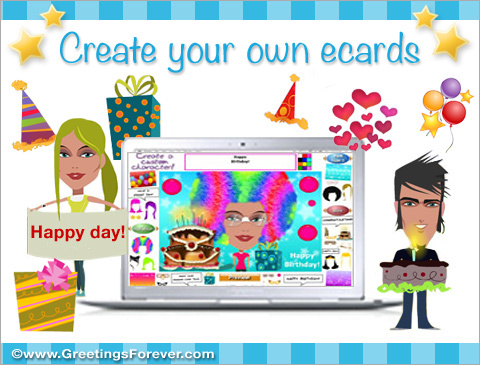 Create your e-card: Best Wishes!